Published on March 21, 2019 in Constructioneer, Daily Dirt and National. Closed Tags: asphalt, bridges, concrete, construction, construction industry, contractors, economy, employment, equipment, Federal Highway Administration (FHWA), Federal Highway Trust Fund, gas tax, heavy equipment, Highway Bill, highways, infrastructure, Interstate Highway System, jobs, National Highway Traffic Safety Administration (NHTSA), pavement, roads, safety, the American Association of State Highway and Transportation Official (AASHTO), the American Road and Transportation Builders Association (ARTBA), The Bureau of Transportation Statistics (BTS), the Center for Transportation Studies, the Maryland Department of Transportation State Highway Administration (MDOT SHA), the Texas Transportation Institute (TTI), the U.S. Census Bureau, transportation, TRIP. Maryland’s quality of life and economic development is being hampered by high levels of traffic congestion and reduced accessibility, but is benefitting from a statewide program to improve accessibility and Governor Hogan has proposed a comprehensive set of transportation improvements designed to improve mobility, according to a new report released by TRIP, a Washington, DC based national transportation research nonprofit. According to the TRIP report, “Keeping Maryland Mobile: Accomplishments and Challenges in Improving Accessibility in Maryland to Support Quality of Life and a Strong Economy,”the state’s roads carry the highest traffic volume in the nation and commute lengths are the second longest in the U.S. Traffic congestion costs the state’s residents and businesses billions of dollars each year and severely constrains the number of jobs accessible to residents. The Maryland Department of Transportation State Highway Administration (MDOT SHA) is implementing a plan to relieve congestion and enhance reliability, and Governor Hogan has recommended a $17.8 billion multimodal congestion relief plan designed to accommodate growth and improve economic development. Maryland’s major urban highways and roads carried the highest average daily traffic per lane mile in the nation in 2017. The average daily commute for the state’s residents was 32.7 minutes, the second longest average commute in the nation, behind only New York at 33 minutes. 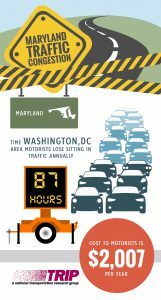 The average driver in the Washington, DC area loses 87 hours to congestion each year at an annual cost of $2,007 per driver in lost time and wasted fuel. In the Baltimore area, the average driver loses 50 hours to congestion annually at a cost of $1,220 annually in lost time and wasted fuel. 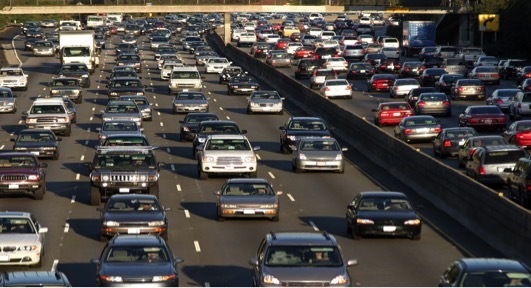 Congestion on the state’s highways, freeways, and major arterial roads costs the public $3.4 billion annually in the value of lost time and wasted fuel. Traffic congestion also impacts the number of jobs available to residents. in 2017, of the approximately 1.9 million jobs accessible within a one-hour drive to residents of the Baltimore metro area, only 30 percent are accessible within a 30-minute drive. And, of the approximately 2.6 million jobs accessible within a one-hour drive to residents of the Washington, DC metro area, only 24 percent are accessible within a 30-minute drive. In 2017, the number of jobs accessible within a 40-minute drive in the Baltimore and Washington, DC metro areas during peak commuting hours was reduced by 38 and 47 percent, respectively, as a result of traffic congestion. The TRIP report also identified the most congested portions of Maryland highways and arterial (non-freeway) roadways during weekday AM and PM peak travel hours. The chart below details the ten most congested highways and arterial roadways during peak AM and PM travel hours. A full list of the most congested segments is included in the report. Freight shipments in Maryland, which are primarily carried by trucks, are expected to increase significantly through 2040 due to population and economic growth, and changes in business, retail, and consumer models, which rely on a faster and more responsive supply chain. The efficiency of freight movement in Maryland is threatened by traffic congestion, which reduces the reliability of goods movement to and from destinations in the state and through the state. The chart below ranks the five highway segments in Maryland that provide the worst travel reliability for commercial trucks as a result of traffic congestion. A full list is included in the report. MDOT SHA congestion relief programs – which include an incident management program, additional park and ride spaces, HOV lanes, new sidewalks, and bike lanes, and improvements to at-grade rail crossings and major intersections – were estimated in 2016 to save approximately $1.6 billion in reduced delays, fuel consumption and emissions. In addition to the efforts already underway, Governor Hogan has recommended a $17.8 billion multimodal congestion relief plan that includes the following: widening approximately 70 miles of Interstates via funding provided through a public-private partnership, completion of the Purple Line from the Bethesda Metro Station to the New Carrollton Metro Station, and a statewide expansion of the smart traffic signal program. Accessibility is a critical factor in a state’s quality of life and economic competitiveness. The ability of people and businesses using multiple transportation modes to access employment, customers, commerce, recreation, education and healthcare in a timely fashion is critical for the development of a region and a state. Maryland’s quality of life and economic development is being hampered by high levels of traffic congestion and reduced accessibility, but stands to benefit from a statewide program to improve accessibility in the Old Line State and could realize significant benefits from a proposal for an even more robust program to improve mobility. TRIP’s “Keeping Maryland Mobile” report examines the mobility and efficiency of the state’s transportation system and improvements needed to enhance access. High levels of traffic congestion on Maryland’s major urban roads and highways reduce the reliability and efficiency of personal and commercial travel and hamper the state’s ability to support economic development and quality of life. Maryland’s major urban highways and roads ranked number one nationally in 2017 for the average amount of traffic carried daily per-lane-mile, and second nationally in average daily commute length from 2013 to 2017. The following chart shows the number of hours lost annually per average driver in the state’s two largest urban areas and the per-driver cost of lost time and wasted fuel due to congestion in 2017. In its 2017 state mobility report, the Maryland Department of Transportation State Highway Administration (MDOT SHA) estimates that congestion on the state’s highways, freeways and major arterial roads costs the public $3.4 billion annually in the value of lost time and wasted fuel. A Center for Transportation Studies report found that, in 2017, of the approximately 1.9 million jobs accessible within a one-hour drive to residents of the Baltimore metro area, only 30 percent are accessible within a 30-minute drive. And, of the approximately 2.6 million jobs accessible within a one-hour drive to residents of the Washington, DC metro area, only 24 percent are accessible within a 30 minute drive. The Center for Transportation Studies report also found that, in 2017, the number of jobs accessible within a 40 minute drive in the Baltimore and Washington, DC metro areas during peak commuting hours was reduced by 38 and 47 percent, respectively, as a result of traffic congestion. In its 2017 annual mobility report, MDOT SHA ranked the state’s most congested sections of highways and most congested sections of arterial (non-freeway) roadways. Traffic congestion on these routes significantly reduces the reliability of travel times in these corridors. The following chart shows the most congested portions of Maryland highways during weekday AM and PM peak travel hours. The following chart shows the most congested portions of Maryland arterial roadways during weekday AM and PM peak travel hours. The rate of population and economic growth in Maryland has resulted in increased demands on the state’s transportation system. Maryland’s population reached approximately six million residents in 2018, a 14 percent increase since 2000. Maryland’s population is expected to increase to approximately 6.9 million people by 2040 and the state is expected to add another 600,000 jobs by 2040. From 2000 to 2017, Maryland’s gross domestic product (GDP), a measure of the state’s economic output, increased by 45 percent, when adjusted for inflation and U.S. GDP increased by 37 percent. Vehicle miles traveled (VMT) in Maryland increased by 20 percent from 2000 to 2017 –from 50 billion VMT in 2000 to 60 billion VMT in 2017. The rate of vehicle travel growth in Maryland has accelerated since 2013, increasing by six percent between 2013 and 2017. By 2040, vehicle travel on I-495 and I-270 is expected to increase by 10 percent and 15 percent respectively. Travel on the InterCounty Connector, a 19-mile tolled highway from I-370 to US 1, which was opened in stages from 2011 to 2014, increased by 35 percent from 2014 to 2016, reaching a daily average of 50,900 vehicles. Freight shipments in Maryland, which are primarily carried by trucks, are expected to increase significantly through 2040 due to population and economic growth, and changes in business, retail, and consumer models, which rely on a faster and more responsive supply chain. The efficiency of freight movement in Maryland is threatened by traffic congestion, which reduces the reliability of goods movement to and from destinations in the state and through the state. 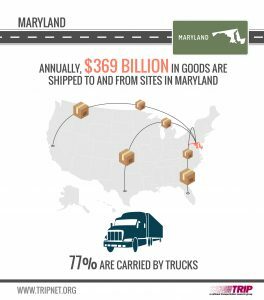 Annually, $369 billion in goods are shipped to and from sites in Maryland, mostly by truck. Seventy-seven percent are carried by trucks and another 16 percent are carried by courier services or multiple mode deliveries, which include trucking. The value of freight shipped to and from sites in Maryland, in inflation-adjusted dollars, is expected to increase 110 percent by 2045. The following chart shows the five highway locations in Maryland carrying the largest number of large commercial trucks daily, and the five highway locations where large commercial trucks make up the largest share of daily traffic. The following chart details the highway segments in Maryland that provide the worst travel reliability for commercial trucks as a result of traffic congestion. Highway accessibility was ranked the number one site selection factor in a 2017 survey of corporate executives by Area Development Magazine. 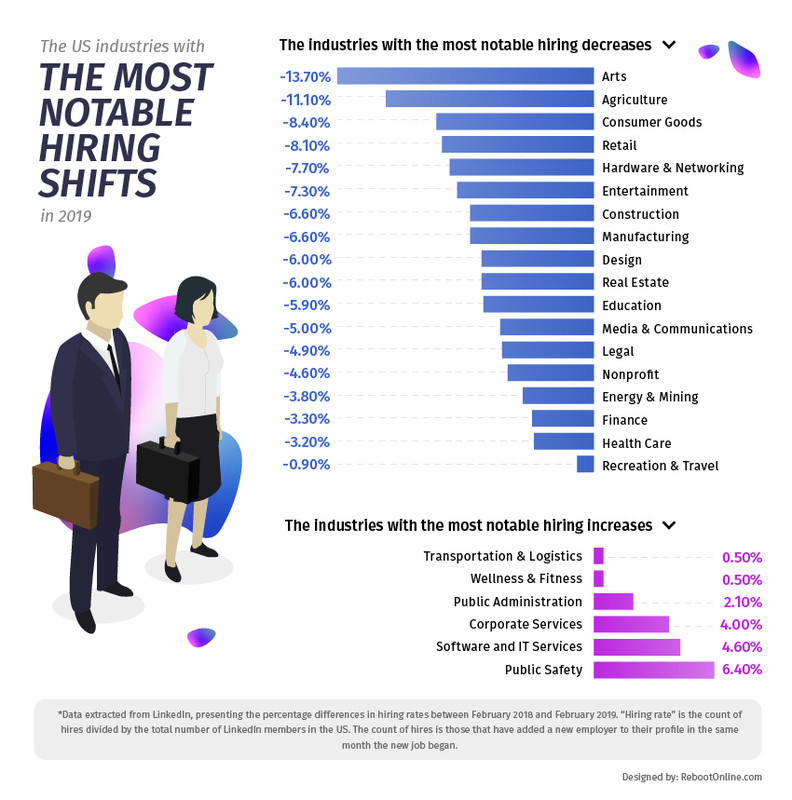 Labor costs and the availability of skilled labor, which are both impacted by a site’s level of accessibility, were rated second and third, respectively. Using a combination of programs and projects, the MDOT SHA is addressing Maryland’s traffic congestion and reliability challenges. These efforts are aimed at improving efficiency and expanding the capacity of the state’s transportation system. MDOT SHA congestion relief programs and projects to improve the efficiency and expand the capacity of the state’s major roadways were estimated in 2016 to save approximately $1.6 billion in reduced delays, fuel consumption, and emissions. MDOT SHA congestion relief efforts include: an incident management program that in 2016 cleared more than 30,000 incidents and assisted approximately 42,000 stranded motorists; improved traffic signalization; the provision of approximately 6,700 park and ride spaces at 106 locations; the use of High Occupancy Vehicle (HOV) lanes on portions of I-270 and US 50; the addition of nine miles of new sidewalks, 88 miles of marked bike lanes and six miles of shared use bike lanes; the addition of four new virtual freight weigh stations; the improvement of eight at-grade rail crossings; and, improvements to ten major intersections and the widening of a portion of MD 355 from Center Drive to West Cedar Lane in Montgomery County. Governor Larry Hogan has recommended a transportation plan designed to provide congestion relief, accommodate growth and improve economic development in Maryland. Using innovative design and funding methods, the goal of the plan is to improve the capacity, operations, and safety of Maryland’s transportation system. Widening of approximately 70 miles of Interstates in Maryland via funding provided through a public-private partnership, including I-495 from south of the American Legion Bridge to east of the Woodrow Wilson Bridge and I-270 from I-495 to I-70, including the east and west I-270 spurs. A traffic relief plan for portions of the Baltimore Beltway from I-70 to MD 43. An active traffic management program for I-95 from MD 32 to MD 100. The expansion of express toll lanes on I-95 from MD 43 to MD 24. The completion of the Purple Line from the Bethesda Metro Station to the New Carrollton Metro Station. Improvements to the BaltimoreLink transit system, the METRO system, and the MARC system. Statewide expansion of the smart traffic signal program. Investment in Maryland’s roads, highways, and bridges is funded by local, state and federal governments. The current five-year federal surface transportation program includes modest funding increases and provides states with greater funding certainty, but falls far short of providing the level of funding needed to meet the nation’s highway and transit needs. The bill does not include a long-term and sustainable revenue source. Most federal funds for highway and transit improvements in Maryland are provided by federal highway user fees, largely an 18.4 cents-per-gallon tax on gasoline and a 24.4 cents-per-gallon tax on diesel fuel. Because revenue into the federal Highway Trust Fund has been inadequate to support legislatively set funding levels since 2008, Congress has transferred approximately $53 billion in general funds and an additional $2 billion from a related trust fund into the federal Highway Trust Fund. Sources of information for this report include the Federal Highway Administration (FHWA), the Maryland Department of Transportation State Highway Administration (MDOT SHA), the American Association of State Highway and Transportation Official (AASHTO), the American Road and Transportation Builders Association (ARTBA), the Bureau of Transportation Statistics (BTS), the U. S. Census Bureau, the Center for Transportation Studies, the Texas Transportation Institute (TTI) and the National Highway Traffic Safety Administration (NHTSA). All data used in the report are the most recent available. Published on March 16, 2019 in Daily Dirt and National. Closed Tags: American Road & Transportation Builders Association, ARTBA, asphalt, bridges, construction, construction industry, contractors, economy, employment, equipment, FAST Act, Federal Highway Trust Fund, Fixing America’s Surface Transportation (FAST), gas tax, heavy equipment, Highway Bill, highways, infrastructure, Interstate Highway System, jobs, pavement, roads, safety, transportation. Seven witnesses tackled questions from committee members ranging from building on the existing partnership between federal, state and local entities to workforce training and development. The FAST Act is set to expire Sept. 30, 2020. 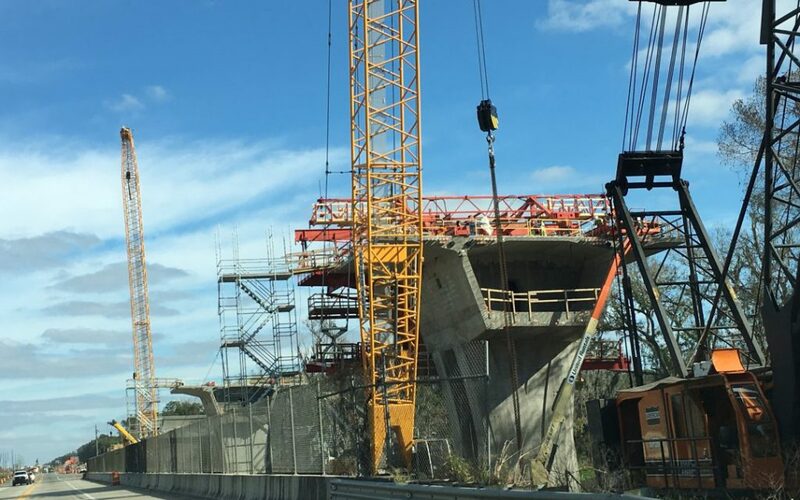 Reauthorization of the law could come sooner, however, with both the Trump administration and congressional Republicans calling for an updated surface transportation law to be the basis for any infrastructure package this year. Mnuchin defended the administration’s plans for a $1.5 trillion infrastructure package and pledged to work with Congress in a bipartisan manner. When asked if a motor fuels tax was part of the president’s plans, Mnuchin did not dismiss the idea but also did not endorse the revenue mechanism. Without an increase in Highway Trust Fund revenues, the next surface transportation law will require an average of $19 billion per year on top of existing user fee revenues just to maintain current levels of spending. 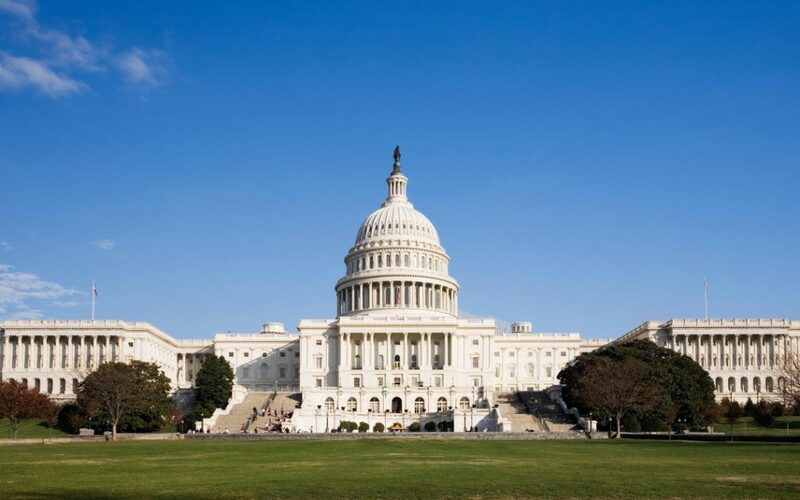 ARTBA staff will continue working on Capitol Hill and with the administration to ensure that any infrastructure package or FAST Act reauthorization includes a permanent, user-fee based revenue fix that will sustain adequate long-term investments in the trust fund.